Last winter, Derek Mason, research agronomist for PGG Wrightson Seeds, conducted a replicated trial comparing nil and three rates of urea in a range of pasture varieties at Lismore in western Victoria. The pastures were perennial ryegrass, Mediterranean tall fescue, phalaris, plantain and cocksfoot. While most graziers don’t utilise nitrogen in extensive pastures, there is an opportunity to fill feed gaps in winter by applying some nitrogen to boost growth. This trial tested three nitrogen rates starting with 30 kg/ha of nitrogen (65 kg/ha of urea), 60 kg/ha of nitrogen (130 kg/ha of urea) and 92 kg/ha of nitrogen (200 kg/ha of urea). Two applications were made at these rates, the first on 29 May and the second on 1 August. The total dry matter, metabolisable energy, crude protein and digestibility of the pastures were assessed from two cuts. Looking at it from the perspective of nitrogen performance, the results were extremely positive across all of the pasture species. In each pasture, applying some nitrogen improved dry matter over the nil treatment. Higher rates meant more pasture growth in almost all situations, all the way up to and including the two applications of 92 kg/ha of nitrogen. Metabolisable energy measured above 11.4 MJ/kg DM across all varieties and treatments. Crude protein increased with nitrogen rates and digestibility was always highest at the highest nitrogen rate. 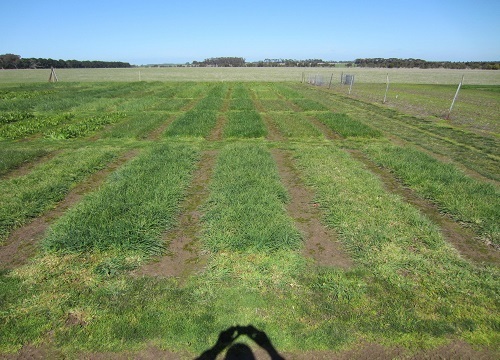 Perennial ryegrass was very responsive to urea in the trial. With every increase in nitrogen rate, yield and metabolisable energy increased. Two applications of 30 kg/ha of nitrogen doubled dry matter above the nil level. 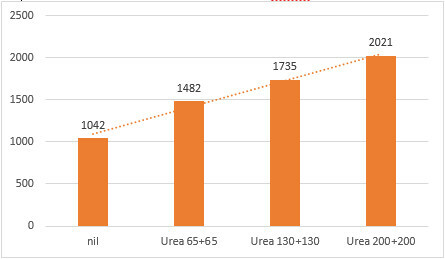 Responses continued with the 60 and 92 kg/ha of nitrogen treatments to a total of 2,216 kgDM/ha. This pasture produced the highest levels of dry matter in the trial at all rates of nitrogen, proving itself to be an exceptional winter performer. Dry matter results stepped up by between 322 and 515 kgDM/ha for every step up in nitrogen rate. At the highest rate of nitrogen, a whopping 2,934 kgDM/ha was achieved from two cuts. This perennial pasture also performed quite well with no nitrogen, recording 1,160 kgDM/ha, and did very well with nitrogen. Two applications of 30 kg/ha of nitrogen in the phalaris produced 1,987 kgDM/ha. The highest nitrogen rate gave the highest dry matter response of the three treatments (2,258 kgDM/ha), as well as the highest metabolisable energy, crude protein and digestibility. and 65 kg/ha of urea. This perennial grazing herb responded well to nitrogen at all rates, with dry matter increasing steadily with increasing rates. The top dry matter result in the plantain was 2,021 kgDM/ha where it was given two applications of 200 kg/ha of urea. The cocksfoot responded well to nitrogen, with a substantial increase in dry matter between no nitrogen and the two applications of 30 kg/ha of nitrogen (920 kgDM/ha to 1551 kgDM/ha). 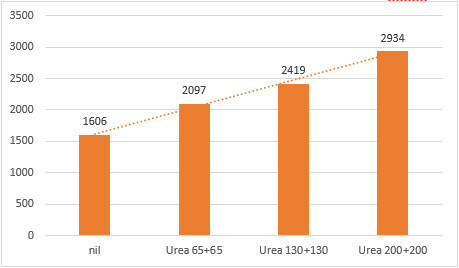 Dry matter increased with increasing nitrogen rates to a top of 2,224 kgDM/ha, where it was given two 200 kg/ha applications of urea. Caption: Cocksfoot responded to nitrogen in PGG Wrightson Seeds’ Lismore trial in 2017. 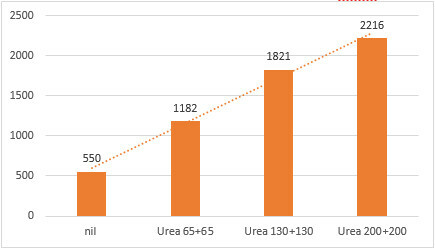 Treatments left to right: 200 kg/ha of urea, 130 kg/ha of urea, nil and 65 kg/ha of urea. 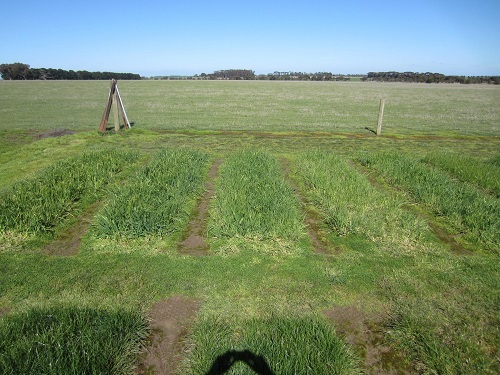 While there were differences between species, nitrogen fertiliser worked well in all of these pastures to produce excellent growth responses, even at higher rates. Nitrogen provides an opportunity to produce additional drymatter above normal growth rates, but moisture is a critical driver in the degree of response. Short cut off springs are a major concern for farmers, so consideration on timing and being proactive about applying nitrogen when soil moisture levels are adequate will give the best results. In the below average rainfall winter/spring of 2015, those farmers who applied nitrogen in late winter to early spring while there was soil moisture present saw a greater response to applied nitrogen than those who waited until mid spring when soil moisture levels were lower. With a greater chance of below average rainfall forecast for this winter/spring, maybe we should heed the lessons learnt from 2015. Please note that these are preliminary results only, which require further statistical analysis along with a detailed cost benefit analysis to determine the most profitable nitrogen rate for each species. For more information, or to discuss the potential for nitrogen fertilisers in your pastures this winter, feel free to contact me on 0412 565 176 or lee.menhenett@incitecpivot.com.au. Alternatively, contact Derek Mason on 0428 126 966 or dmason@pgwseeds.com.au.